Trying to go back to older cook books is always hard. It’s easy to use the newest ones, or just the most recent Good Food mag but I try to throw in a couple at least. This is from a collection of ‘Simple..’ books I have, in this instance – Aldo Zilli. Melt a little butter and oil in a pan and add the onion and bay leaf, cooking until the onion is soft. Add the rice and stir throughly making sure you coat all the grains well. Add the wine and cook until it’s evaporated. Add a ladle of stock and let the rice absorb it. Repeat this until you have almost used all your stock and the rice is almost cooked. Heat the grill and grill the goats cheese rounds for a couple of minutes. Stir in the chopped goats cheese along with the tomatoes and rocket. Cook for another few minutes, adding the remaining stock if required. Add a little butter and the parmesan and season to taste. 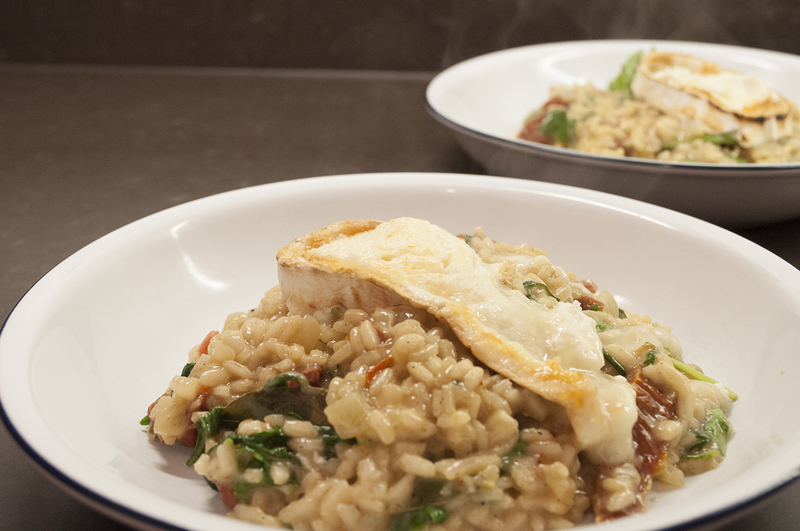 Serve the risotto with the grilled goats cheese.